I really loved both of these books. A lot. They are perfect for where my kids are at. And while this first title moralizes a bit, it doesn't come across in an obnoxious way at all. 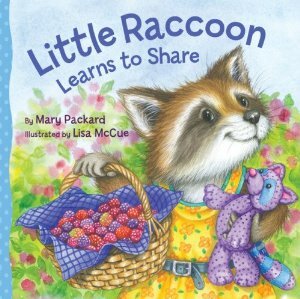 When we meet Little Raccoon, she is picking raspberries when her friends come upon the scene. She is picking berries and has a whole bushel full, but when she sees her friends she hides. She is afraid that if they see her, they will want to eat her berries and she really wants to be able to enjoy them all for herself. Her friends are never aware of her presence but they are having fun playing and together decide to have a little party and enjoy a meal. Each friend volunteers to bring something to the meal to share. Little Raccoon isn't invited because they don't know that she is there! She is so consumed with worry about having to share that she is missing out on a wonderful time with her friends! The book resolves well and she comes to see that sharing her bounty is the best idea as it allows her to have fellowship with others. Furthermore, the illustrations by Lisa McCue feature adorable little animals that look all cute and cuddly, making the story infinitely more palatable. I also wanted to eat some berries after reading this book. 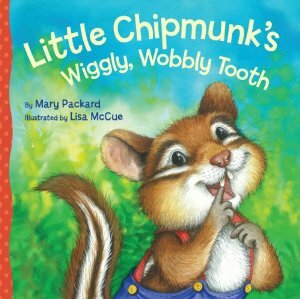 Next up, there is Little Chipmunk's Wiggly, Wobbly Tooth . Several years back I referenced a few picture books about loose teeth. We've read those titles over and over again and I was positively delighted when Little Chipmunk showed up on our doorstep, all concerned about losing his first tooth! In this story, Little Chimpmunk is quite concerned when his tooth begins to feel loose. He fears for his smile (i.e, the way he'll look with a missing tooth) and his inability to whistle well. He isn't aware of the fact that another tooth will refill the hole until the dentist assures him that losing baby teeth is a natural part of growing up. Once assured, he finds glory and excitement in losing his tooth and is no longer worried. It's a very calm and reassuring book about what it will be like to lose a tooth. My oldest was very concerned about the process until it began. (He's now lost about 6 baby teeth and is now all-knowing on this front.) The next son in line isn't worried because his brother has lost teeth and is still living and eating so it must not be all that bad. Still, I think this book is a cute edition to any home library or a great gift to give a young child who is on the verge of losing their first tooth. It can be a scary concept when it's not happened to you and I'm glad to have found another title on this subject to love. Thanks to Sterling Publishing for shooting the above copies my direction in exchange for my honest opinion. I honestly love them both very much! Furthermore, I am delighted to let you know that they have offered 1 set of these two books to 1 of you! Would you care to win the above titles? Simply leave your name and a valid e-mail address in the comment section below! This contest is available to US Residents only and will be open through Monday, April 8th. This contest is part of today's April Fools' Giveaway Event. Click on the link to see what else is up for grabs today! THIS CONTEST IS NOW CLOSED. THE WINNER, as selected by Random.org IS #2- Annette! CONGRATS! These sound like us, too! Very cute illustrations, too. Shared this (and your main post) on fb. I'd love to win these for my grandson! Thank you! Both important topics for kiddos! Thanks! Cute! These would make great gifts!